A couple of weeks ago, Macro Man noted that markets seemed, if not sanguine, at least relatively calm about the prospects of Brexit. 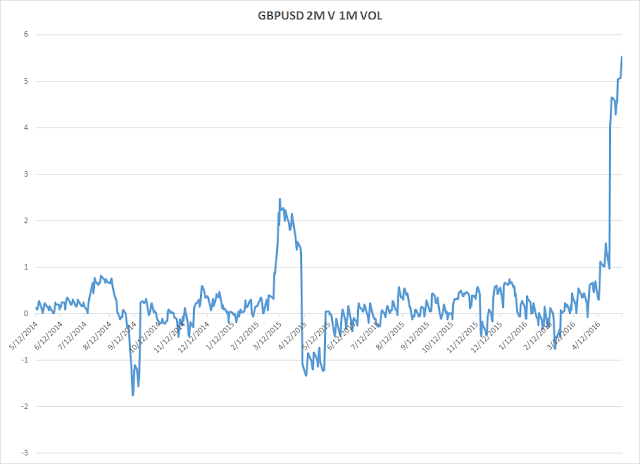 The evidence for this assertion was an apparent tilt in the polls towards the "remain" camp and the fact that the 2m/1m calendar spread in cable vol was actually smaller than the prior spread between 3m and 2m (when only the far date captured the poll, naturally). Fast forward a couple of weeks and things look somewhat different. Not only have the polls narrowed, but hedgers and punters are now reaching for cable vol; the 2m/1m spread has widened by more than a vol since the original post was written. Now, at the moment Macro Man doesn't have a dog in the Brexit fight. He is no longer a UK resident, has only derisory assets remaining in Blighty, and isn't even a citizen. However, by virtue of his long-time residency in the country, the nationality of Mrs. Macro, and the UK's importance to the financial industry, he is naturally interested in the vote and the outcome. Almost as interesting as the outcome itself is the nature of the debate. While HMT has attempted to quantify the negative economic impact of a Brexit via some (occasionally lampooned) equations, comments like David Cameron's warnings about the potential for war really don't belong in a serious political debate. At the same time, Macro Man has yet to see the leave campaign provide any quantification of how the UK will be better off outside of the EU while offering plenty of quasi-Trumpian arguments about those damned foreigners. However, based on Macro Man's experience any notion that the UK will reap some sort of efficiency windfall from exiting the (admittedly labyrinthine) EU bureaucracy looks laughably wide of the mark, as anyone who's had the "pleasure" of dealing with the UK immigration authorities can attest. Putting aside the unprovable (how long will it take for the UK negotiate entry into the EEA? What will the conditions be? ), Macro Man thought it would be interesting to look at some empirical evidence about economic performance inside and out of the EU. Obviously, no two countries' circumstances are identical, and it can be difficult to isolate the economic impact of EU membership from other cyclical considerations. However, at least reviewing the historical record has got to be better than simply making emotional assumptions, so let's see where the data takes us. Macro Man found GDP data going back to 1955 for the UK. Happily, he also has it for France, a similarly-sized economy at the heart of the European project. He also downloaded it for the US to serve as a "control" group to sense check the global economic cycle. The chart below shows y/y GDP growth for the three countries going back to 1956. Since the UK joined the EEC in 1973, its economic growth has been on a par with France's (a smidge better, actually), though continuing to lag that of the US. A key turning point was clearly the allocation of monetary policy duties to the Bank of England (and away from the Chancellor.) From '73 -'97, the UK narrowed its growth gap to France but saw it widen vs. the US. Since BOE independence, however, the UK has handily overtaken France and more or less eliminated the growth gap to the United States. Indeed, since acceding to the EEC UK growth has remained remarkably stable, even as that in France and the United States has steadily slowed. It's hard to see the negatives in that. 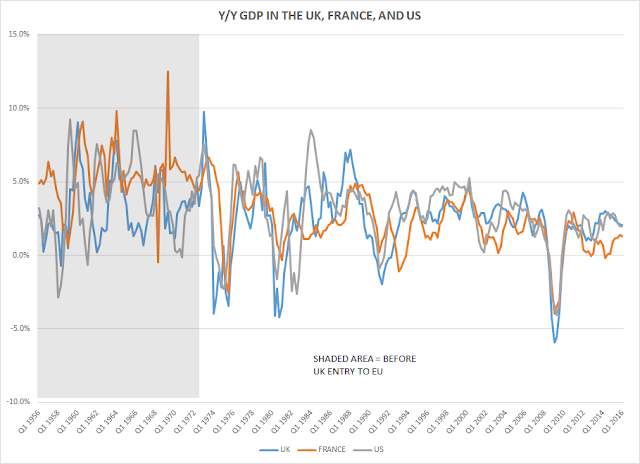 As an aside, in the years prior to EU membership UK y/y growth outpaced that of France in a mere 16% of possible quarters; since joining, the UK has performed better 55% of the time. The results are set out in the table below. 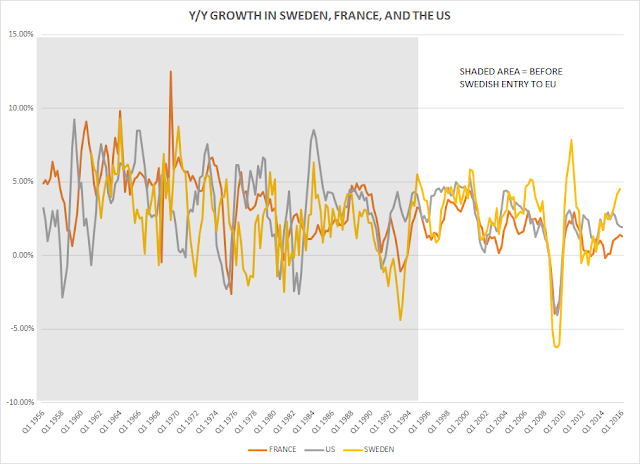 Like the UK, Sweden under-performed both France and the US from the beginning of the data until EU entry. Since then, however, the country has done very well indeed, outperforming not only the French but also the United States. The shift can be observed in the chart below: in the 20 years prior to joining the EU, Swedish y/y GDP bested that of France just 36% of the time; in the two decades since, Sweden has performed better a resounding 81% of the time. Nevertheless, based on this cursory reading of the data it is possible to make the claim that EU membership has benefited the UK economy (at least on a relative basis) and very difficult to state that it has hurt. Certainly the evidence suggests that having an independent monetary policy is helpful, both given UK and Swedish economic outperformance and the sclerotic growth registered in France, which is tied to ECB policy and a fixed exchange rate. There may be other reasons to oppose EU membership (some justified, some probably not), but the historical record suggests that from an economic perspective, remaining inside the EU and outside the euro is not a bad place to be. You have to feel for us plebs here and in the UK. I mean seriously, there's so much to do in life and we have to participate, if I was a Pom that is..in the unelected and self entitled politics of Brussels. With all the ties and connections through the European monetary and political system you would think they'd just leave a poor pleb alone and fall back on their elite education..not to mention all that liquidity to increase their own country's GDP...but,at the end day, all they want do is find out if you too can reach you ankles. Great job! keep it up..the worlds a better place with you in it! I think it's impossible to draw any conclusions from such a small study and sample size, given how many different factors influence GDP growth. This exercise is akin to reviewing the diets of 5 people and then comparing their heights. Differences in diet may be a reason for their different heights. But probably not. That said, I do agree that British bureaucracy can be on par with the continent's. BoJo was forced to admit (in front of the Treasury Select Committee) that it was actually Cardiff City Council that banned the recycling of tea bags, not the EU itself. @ Anon 9.41 That those Poles are in the UK by virtue of their mutual EU membership make their presence rather relevant to the discussion, eh? Politics may be the biggest scam ever sold to the public. For centuries (most of Europe) it's been sold to the unwashed has a necessary and beneficial defence against the worst behaviour of despots/monarchs. Like many good ideas this is also one that people took and corrupted beyond recognition. It turned into nothing more than another big Industry whose primary mandate is survival through growth in size and clout. Occasionally it's interests and those of the unwashed might even coincide temporarily fulfilling some of that original benign intent. For the most part it just grinds on getting ever bigger ,ever more intrusive, ever less value adding. So, I applaud your attempt at least to introduce some form of quantitative data and we can argue whether or not over it too simplistic a way of getting at a conclusion over the In/Out issue. Unfortunately, for me that misses the main point, I think it misses because it isn't even answering the right question which might be how much better off economically might we be if we could reduce the size of this ever growing Industry and the cost it brings to bear on the societies it is supposed to be managing. Cue David Cameron saying "small goverment, big society" then we can all fall over laughing at the pure audacity of such a bluff ever being called. Needless to say I stopped voting at any level of election some years ago. The only legitimate vote for this problem is to abstain completely and show it for the nonsense that it is. It's called sovereignty. If The People of England want liberty, even under a pseudo-monarchy, and abide by a rule of law constructed and catered for their own people, then they should leave. If The People of England want less liberty, and be ruled by laws of others, some of whom whose interest conflict with their own, then stay and be ruled by non-elected bureaucrats out of Brussels. Still no quantification. Also, it is kind of ironic to complain about having laws imposed by people you didn't vote for when the current UK government got barely a third of the votes in the last general election. @MM - don't you get it? For the next few years, everything proposed by people who read books, and have advanced degrees from good schools will be rejected, and the opposite will be accepted - intelligence inequality is the most pressing problem faced by our societies, and reparations must be made. Before you ask me for quantification for this cavalierly made statement, I would like to declare that I am already on with the program and have no idea what that word means. Jokes apart, there is no 'right' or 'wrong' here, just different - I don't think anything changes dramatically unless a website domiciled in the UK is not allowed to be accessed in EU, and vice versa - increasingly thats the only trade that matters. Brexit is a much smaller deal than if, say, India were to ban Facebook one day. On the flipside MM, all this fear mongering of war, inflation (I thought they wanted that), fall in sterling.... If they want people to vote to remain, just tell them there'll be restrictions on their premier football teams. No more Dickheado's scooping loadsa money. Spike in initial claims data. Recessionistas will be screaming... I Told You So. But it is probably just a bump. The long end is selling off, the import price data seems to be "trumping" the employment numbers. The relationship between the long end and inflation is a greatly underestimated thing, perhaps forgotten recently in the reach for yield, or perhaps simply unknown to younger investors because we haven't seen a great deal of inflation recently (at least in the official figures). Real world inflation continues to ravage the US lower middle class, however (rental, urban transportation, health care, education) while older and upper middle class Americans (homeowners, car drivers, HMOs, no loans) are sitting pretty, basking in the glow of Lower for Longer. The PPI and CPI are soon going to begin reflecting some of the increased wages and commodity costs we have seen in the last three months or so. Dame Janet may actually have to do something on behalf of The People on Main Street. This is not a very good time to be long fixed income, imho. [Yes, we are short the long bond]. I was just having that conversation...under current UK rules, none of Mahrez, Payet, or Kante (half the shortlist for player of the year) would have qualified for a work permit. "basking in the glow of Lower for Longer"
b) Is sufficiently older to have risk adjusted his portfolio and thus is 'basking' in a drop in income which completely nullifies any deflationary benefits in sight. Let me tell you older ain't having much fun these days either unless he's also in the 'select' grouping. If we are talking quantitative I'd really like to be able to see the extra economic activity created by low rates measured against the offset of lost consumption from aging groups who have basically been told they'll live longer ,but have less capital for that purpose leading to 'austerity' like consumption behaviour. I mean f...k me I'm personally getting by on just 4 or 5 cruises a year. At this point I wish I could think up an Hitler analogy just to keep Pol happy. LB, Left this comment at the bottom of yesterday's post. Wasn't sure you saw it. Copper is telling you all you need to know about bond yields. Copper doesn't care about the FED and its silly 25 bps here or there. It. Is telling you that GDP growth globally is headed lower and you best be ready for the deflationary wave that washes over everything. The widow-maker trade is not confined to Japanese fixed income. AUD and CAD move lower because the interest rate differential is going to collapse and not from higher U.S. rates. Look at Aussie 10's over the last 10 days and tell me yields are gonna move higher. Hope I'm not coming across as critical. I enjoy your perspective. The comments are part of the reason I like this site as much as I do. SP500 position update. Took another 25% of the position off near yesterday's close (which was rather annoying with this morning's EU rally). The rest of the position has been closed during this US session. I've lost confidence that we break higher here. So all-in-all, a profit but nothing amazing results wise. Just posting for transparency. LoL! Welcome to The United States! Piss poor electorate where barely anyone shows up to vote, and those that do, vote in the "winner" by an extremely small percentage for those who will rule over a great many! Anon @ 3:43 - well compulsory voting doesnt help I can tell you right now. Down under our PMs have been deposed GoT style non stop over the last few years. Mkt action is telling me it has already started questioning the further effectiveness of 0/- interest rate and QE alike policy in inflating risk assets after such a long time. CB is approaching the limit to say the least. I'm not saying we will see an immediate collapse. The CB 0/- rate policy on its own would imply very low return for risky assets in equilibrium. So as MM and others suggested, we may see mkt swings ... until something blows up in China/Europe/Japan. learn how to short now, you'll make more dough. short between now (agressive) and May expiry (you might get a higher entry, or not be short at all). cover at 1950 in the next 4 to 6 weeks. good luck. Dax is really beginning to Yo Yo, volatility cranking up. Pol could be onto something. We are forgetting how bad Asia is performing. Given the appalling level of debate currently underway in this country (e.g., whether a post-Brexit UK will still be able to participate in the Eurovision song contest) and the likelihood that the establishment will play dirty(ier) if they think they'll lose (remember Blair sending the tanks to Heathrow every time anti-Iraq War fervour bubbled up?) I doubt there's much chance at all of a Brexit vote. The bookies and the event risk markets seem to have a better handle on the nature of my fellow-countrymen when faced with the prospect of significant political change than do the polls. To paraphrase Ben Franklin, those who would give up essential sovereignty to purchase a little temporary (and highly debateable) economic security are likely to end up with neither in a Europe increasingly subordinated to the unfettered economic and political power of Germany. Then I goto London and speak to the locals. Finance guys and the general London crowd are all voting stay. Mostly an international bunch anyway. "Fourth Reich is no way to avert further catastrophe - indeed, quite the opposite...."
@Cityhunter/Nico - Thanks, you may well be right. The turnaround in Dax today was particularly worrying... up 2% for a brief while and then straight down. US equities weak across the board. Back to the sidelines for me. Anyone who watched the farce that was the Scottish referendum can't help but note the similarities to date ..will they ,won't they ,ooh how close it is. That one wasn't that close in the end and I doubt this will be either. We're not a nation of 'fight them on the beaches' patriots anymore. We've morphed into cuddly little things that get our thrills from watching cooking and baking TV for lords sakes. On that note we much prefer the safety of the herd to protect us from The Big Red Bear ,or heaven forbid tarts with soggy bottoms. Dax is down because it's most heavy-weight member Bayer (9% of Dax weighting) is down heavily due to the monsanto bid. besides that, I'm not really torn to any direction right now. Energy still looks bullish to me. neutral on equities. Just FYI, I hardly disagree with anything you posted above, but as a short-term trade I do think US bonds will trade lower here, perhaps the long bond auction is sending the same message. We are talking a few days to weeks at most .... and yes, we agree completely that further commodity weakness and declining spreads will drive AUDUSD and CADUSD lower, and yes, we do think there is a chance of a stupid 25 bps from the Fed as well!! MM often points out that the market leads the Fed, let's see whether any US data can move the needle at the front end over the next six weeks. The recent move in oil prices alone should ensure mildly firmer inflation data and (via gasoline prices, b/c people have to buy it to drive to get to work in the US) somewhat stronger retail sales data. The Fed are not robots, they look at JOLTS, payrolls, inflation expectations and CPI and they know that an inflation surge into the election would be a bit naughty, so why not nip it in the bud now in June or July, knowing that September is probably too close to the Main Event. Henner, that Bayer rumour was out before euro cash open. Still rallied. Sure, it got a refreshing headline around 2pm (London). US markets took a dive on their cash open and Europe went with it. Apple talk, retail & commodities. I wonder if Brexit takes June off the table, given the White Dove's interest in everything NOT related to U.S. economics. So, conversely, does a vote for BREMAIN mean that June is back ON the table? I can tell you one thing, the British dislike radical change even more than they dislike foreigners. Conservatism will trump xenophobia quite handily on the day, especially after a few scare tactics are deployed close to the vote, as they no doubt will be. Sorry. LB. For some reason I thought FOMC was before UK vote. Macys, Kohl, Nordstrom. Not looking great out there. Amazon might be blowing it out with cloud, and facebook ad revenue but surely they are shifts of spending from one service company to another. Consumers not spending their cheap gas money in retail anyway. MM, could you do a sector analysis of regions? As Stardust said, "the music sounds better coming from you"! Sector analysis in what sense? Retail, Miners,Energy, tech etc how are they fairing QoQ. US retail getting beat down, UK with some decent job cuts at BHS. Miners & energy with capex cuts. Are we just reliant on the Cloud now? Oh, similar to how you ran this post on Brexit. Apols if asking for a lot. You just have the skills! No promises, but I'll have a look. This type of stuff takes a while to set up. Grateful for everything/anything you do MM! Brexit - you guys will figure it out. No sweat. 1) Look at GDP/Capita instead - basically flat annual growth since 2007. 2) Look at correlation between Swedish export growth and China pre 2007. 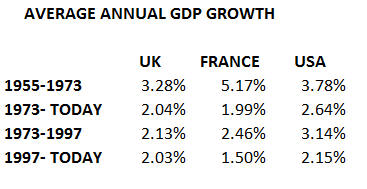 3) EU = Germany, UK , Denmark and Finland when it comes to EU related growth. 4) Look at Swedish underinvestment in infrastructure, defense, civil defense, police, medicare, pensions and education. 5) Look at Swedens increased spending on migration(70BN SEK annual direct cost, another 200BN SEK indirectly), increased crime rates and insurance-, med-, socialcare fraud rates. 6) Look at total debt vs GDP: 300% and growing. Summary: Swedish GDP is far from what it looks like. Conclusion: beware of bullish conclusions on Swedish economy - especially in conjunction with the EU. Dalio said 70% of buying was attributable to buybacks and M&A, not 80% as I wrote before. Was at a Blloomberg interview in Sep '15. Just wanted to correct that. Answering Swiftie, I would probably want to see very material upside from here. Perhaps another QE program which dislocates money from fixed income into equities, but we'd probably have to see a market fall before that. I have a high bar to get involved in directional equity bets because I haven't in the past achieved anywhere near the positive skew to returns that I get in other markets. Only exception is in very short term bets, which are rare.